• Chocolate – Theobromine, a component of chocolate, is toxic to dogs and can cause vomiting, diarrhea and in some cases, death. • Onions – Too much onion, no matter what kind, can cause anemia in dogs. • Grapes & Raisins – Too many grapes or raisins may negatively affect your dogs' kidneys. • Cooked Bones – Turkey and ham bones may be sharp and could pose a choking hazard to your best friend. 2. Light the Tree with Caution: Keep electrical cords tucked away and ornaments out of paw’s reach. If your pup gets curious and decides to chew on a wire, she could get shocked and even electrocuted. Ornaments, as we all know, tend to easily break very easily and can cut a pet's mouth or paws. If you are going out, consider unplugging lights or putting your dog in another room away from the temptation of cords and shiny decorations. 3. 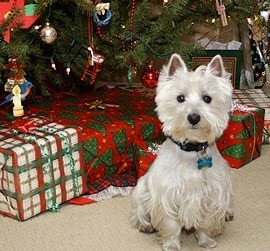 Go for the Faux: If your dog is more curious than most, you may want to use an artificial tree rather than a real one. Tree water may contain fertilizers. If your dogs drink it, they could experience nausea and diarrhea. 4. Plant It Up High: Certain holiday plants such as mistletoe, holly and poinsettias can cause vomiting, diarrhea, gastrointestinal and cardiovascular problems if ingested. Make sure all of these plants are up high or opt for artificial versions. 5. Stuff Wisely: We stuff our pet's stocking just like any other member of the family. Choose safe gifts such as dog-safe toys and treats they love to eat. 6. No Escaping: If you’re hosting a holiday party, consider keeping your dogs away from the front door when guests are coming and going. Especially if your dogs have the tendency to run out the door the first chance they get. Always make sure they're wearing their collar and dog tag just in case they do escape. 7. Give Them Peace and Quiet: Some dogs enjoy visitors, but others may get nervous and scared around new people. Set up a quiet, safe room with fresh water and a place to relax away from your guests. 8. Leave The Drinking to The Adults: If your guests are drinking alcohol, remind them to watch where they put their drinks, especially if your dog is curious. Just a few slurps of red wine can make your dog disoriented and potentially ill.
9. Don’t Be Gone Too Long: If you're like most of us, you attend holiday festivities throughout December. From company holiday parties, to get-togethers with friends and family, there could be times when your best friends are left alone a little longer than normal. A change in schedule like this may cause stress and nervousness. If possible, plan ahead for these types of events. If you have to go straight to a company holiday party after work, for example, see if a friend or neighbor would care for your dog during that time. 10. Ring in the New Year Responsibly: Noise makers can be very scary to pets and could cause damage to sensitive ears. Remember dogs hear at much different frequencies than humans and high pitched sounds can be uncomfortable and painful for your best friend. Skip the noisemakers and instead enjoy bringing in the New Year with your best friend by your side!